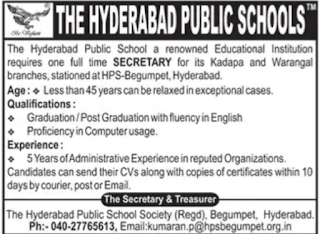 The Hyderabad Public Schools, Hyderabad has advertised in the Deccan Chronicle newspaper for recruitment of Teaching Faculty- Secretary jobs vacancies. Interested and eligible job aspirants are requested to apply with in 10 days.Check out further more details below. 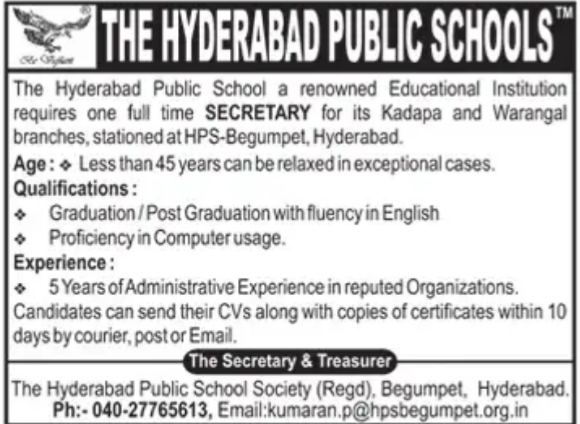 Name of the School : The Hyderabad Public Schools, Hyderabad. About School: Hyderabad Public School was established in August 1983 and has completed 34 years in imparting quality education. The school equips the children with knowledge and right values thus grooming the children in totality. The school is sponsored by Vasavi Academy of Education, a renowned philanthropic organization managing a number of educational institutions in the city and outside. The school is a vivid manifestation of our motto ‘’LEARN TO SERVE’’ and dedicated to the students of today to be worthy citizens of tomorrow. Age : Less than 45 years can be relaxed in exceptional cases. Graduation/Post Graduation with fluency in English. 5 years of administrative experience in reputed organization. Reference: Recruitment Notification / Career Job Opportunities notice for Teaching Faculty - Secretary Jobs on Deccan Chronicle newspaper Dated 5th July 2018.